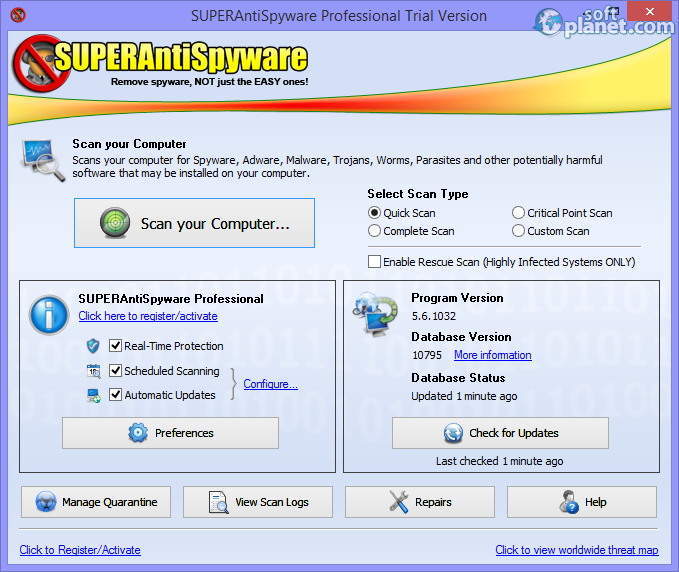 SoftPlanet makes it possible for everyone to get free SUPERAntiSpyware download directly from our servers. There is no registration needed for downloading. 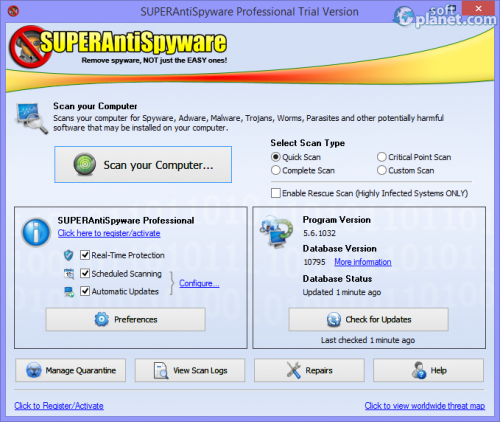 SUPERAntiSpyware 6.0.1212 is a program which falls in the security category. It will protect you from various threats in real time and will scan and disinfect your computer from whatever spyware problems you may have. It is one of the fastest scanners available today and at the same time performs a deep scan and is also capable of repairing the Windows registry. All types of malware, trojans, parasites and all harmful apps will have to find a new home because yours is not welcome to them anymore. There are Free, Professional, Educational and Portable versions. All of them can be downloaded and evaluated for free during the trial period. SUPERAntiSpyware can be used in more than 10 different languages. It is compatible with Windows XP, Vista, 7 and 8. The latest version has a faster scanning method, a quicker setup process and enhanced real time protection. The automatic updates and the scheduled scans can be configured in the best way possible so to not interfere with the time when you use your computer the most. You have four scan types which you can perform, there is an easy way to manage the quarantine items and to change all the program settings and options. 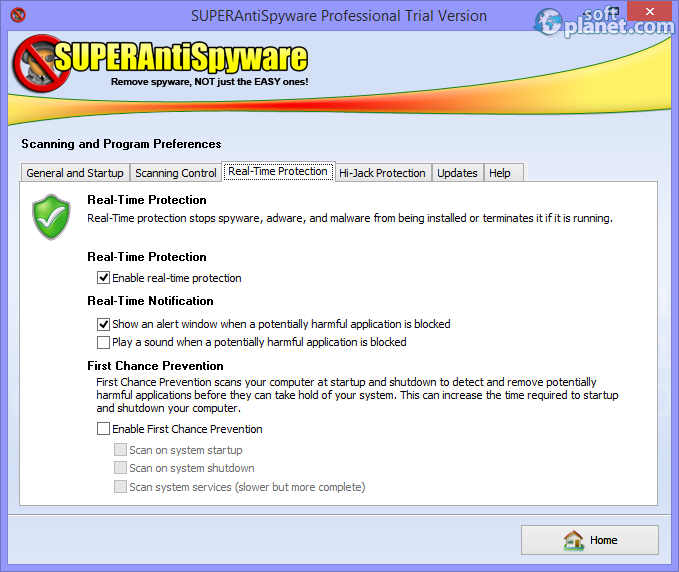 When you finish the installation, SUPERAntiSpyware offers you to register and also tells you that it will connect via the Internet to check for recent updates, new definitions and submit results which will help identify harmful software apps. You can take the check-marks from these fields off if you want. The interface of the program is designed well enough to provide full usability and is very comprehensive. One of the useful options is that you can reset the program options to the default settings if you like. To use SUPERAntiSpyware is not hard at all. Also you do not need a special instruction to start using this scanner. Just press the Scan button and after a while you will see the result summary in a pop-up window. Then all you have to do is press the Remove button and all your computer problems will be far away. 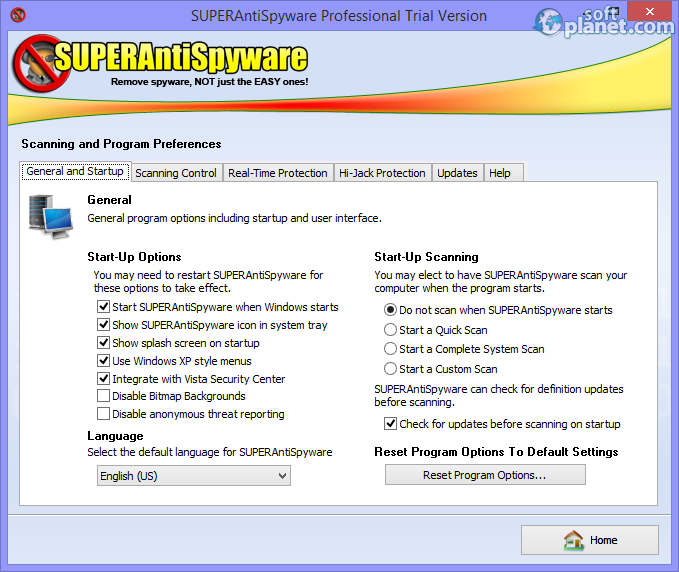 SUPERAntiSpyware 6.0.1212 is not like most of the programs which are used in the security field. The free version has some limitations but still works and removes threats, fixes registry problems and is capable of creating detailed reports. We have evaluated the program and can recommend it to you as one of the excellent choices for novice and advanced users. Our security scan shows that SUPERAntiSpyware is clean from viruses. The current version of SUPERAntiSpyware has been scanned by our system, which contains 46 different anti-virus algorithms. That ensures that SUPERAntiSpyware 6.0.1212 is 100% safe for your computer.